On-demand training teaches Insurance and Accounting professionals how to provide Defined Contribution solutions to clients. 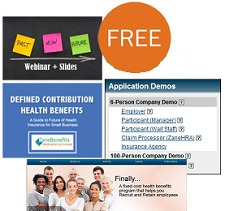 Zane Benefits, which provides businesses with comprehensive and flexible defined contribution health benefits and private exchange solutions, today announced it had published a free kit named “Defined Contribution Health Benefits Training Kit for Insurance Professionals and CPAs” to provide insurance and accounting professionals with free training on defined contribution solutions. Zane Benefits has worked with insurance and accounting firms of all shapes and sizes over the years. As a result, they've been given a unique glimpse into what challenges they most often face. According to the Zane Benefits website, employer-based health insurance has evolved. It's no longer just a simple annual renewal. Now, it's defined contribution health benefits and public health insurance exchanges. Defined contribution health benefits can help overcome hurdles like minimum contribution and participation requirements.